Michael Lally, an immigrant to Massachusetts from Ireland, fought for the Union in more than a dozen major battles of the Civil War, including the first and second Bull Run (Manassas), the Siege of Yorktown, Williamsburg, Fredericksburg, Chancellorsville, and Gettysburg. A soldier in the 11th Massachusetts Regiment, Lally wrote letters from Maryland and Virginia to his wife and children in Roxbury, Massachusetts, chronicling his experiences on the front. 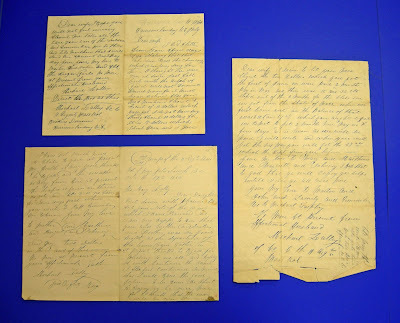 The collection at Brandeis includes 57 of Lally’s letters, the first dated July 16, 1861 (just before the first battle of Bull Run) and the last dated June 6, 1865 (after Lee’s surrender). 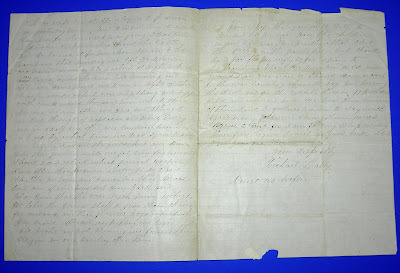 The letters describe particulars of battle (“we have a good many sick and its no wonder... thur is all of 10 000 men buried here and as much as 1000 horses kild on the field….”) as well as more mundane matters, such as the need for postage stamps, handkerchiefs, a flannel shirt, or whiskey (which, to his great dismay, was removed from one of the boxes sent by his wife: “there is the meanest officers in Army that could be picked out of any nation... I am thinging if we have to go in to another fight that ther will some of them pay for robbing soldiers boxes”). 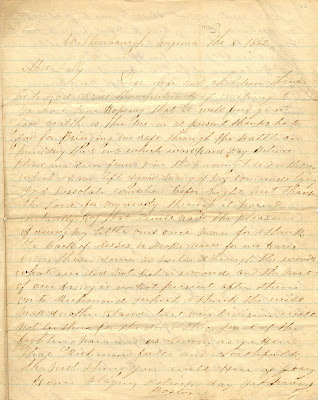 Lally writes often about sending money home and asks for news of the family as well as friends and neighbors; his letters are sprinkled with prayers for his and his family’s safety and words of reassurance: “Tell Mary to write to me when she gets time and tell her no to be afread” (10 August 1863); “Tell Johnny that I will try to go hom this winter and by him a sled” (4 December 1864). “Dear wife and children thanks be to God I have the opportunity of writing to ye once more. Hoping that it will find ye in good health as this me in at present. 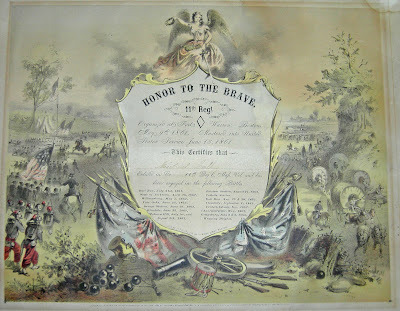 Thanks be to God for bringing me safe through the battle on Munday the 5 ins which was a hard day between blood and rain from 7 in the morning till 7 in the eve which I have left a good many of my comrades lying in a desolate condition before night. But thank the Lord for my safety through it. Now I sertantly hope that I will have the pleasure of seeing my little ones once more for I think the back of Sesses is broke now for we have drove them some 30 miles a through the woods, What we did not kill or woond, and the most of our Army is in hot pursuit after them on the Richmond which I think they will make another stand. But our division will not be there for the don their part of the fighting now and as swoon as ye here that Richmond falls and Northfolk the next thing you will here of going hom playing Patrick’s day (—?) through Boston." In a letter from Maryland, Lally writes: “We have (conversation?) with the Rebb’s avery day and the most of thim is Irish and the most of thim from New Orleans” (November 14, 1861). This particular letter is written in berry juice (“Let me now is this writing looks red for I made this ink out of Berrys”). On April 21, 1863, he wrote to his wife: “In regard of what John Garvey told ye that I was in the cook house it was a mistak of his. I never was doing any such work since I com out here. I would not leave my plase in the ranks for it is no trouble for me to do my duty as a soldier.” Lally’s letters provide a glimpse into the day-to-day wants, sufferings, triumphs, and small comforts of an ordinary soldier, trying to provide for his family and to live through the war so that he can join them at home again. Photos and scans by Maggie McNeely.